Rest and be thankful. | Life. Realized. Saturday was a busy day. Because we hope to have our house on the market by September 1, we have started to see our home through the eyes of a potential buyer. And from the perspective of two people who will be moving a family of three across country by ourselves. This meant two trips to the dump (hauling our own trash is not something I am going to miss), cleaning, and bags full of clothing and shoes marked for Planet Aid, Salvation Army, and local consignment shops. After our chores were finished we decided to go for a drive. To get away and recollect our thoughts. We drove rather aimlessly ("should I go left or right at this intersection?") and ended up in the lovely town of Putney, Vermont. There is a certain peacefulness to that particular town. 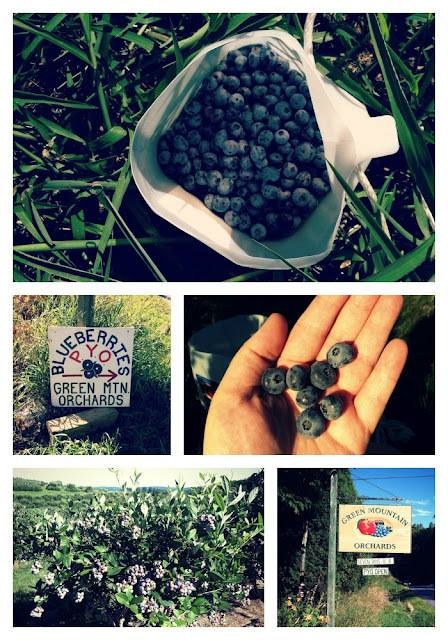 We stopped by our favorite orchard and picked blueberries, a treasured late summer pastime. The boys could pick blueberries every day. In fact, we are still using up last year's bounty. The trees were full of ripening apples which brought about excitement for the fall apple picking season. This orchard is like no other... the rolling hills full of fruit trees and bushes go on forever. We love wandering through the beautiful acreage. After berry picking we dined at a pub in Putney we've never tried. The food hit the spot. In fact, "shitake fingers" are my new favorite food. The waitress even went out back and picked the mint for my mojito. 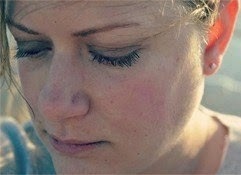 Stepping away from burgeoning pressures and everyday responsibilities was nice. I'm glad we took the opportunity. Mario left for San Diego yesterday and won't be back until Friday. The day the realtor comes to look at our house. After weeks of having him nearby, I miss his guts. I'm using this week to accomplish tasks around the house. Some painting, some sprucing... and a little packing. Mostly chachkies that won't be missed. Half of my Pyrex collection is carefully tucked away where it will serve to brighten our next kitchen. I like the idea of putting things away. When my son was smaller I used to rotate his toys; tucking a portion of them away at any given time. When they came back out, it was like he'd never seen them before and he played with renewed interest and excitement. I imagine rediscovering our favorite knick-knacks will bring a similar feeling. I like the productiveness of the last couple days. I've been getting up, enjoying a cup of coffee or two while I ponder my to-do list, then going about tackling my chosen projects. Although I've been juggling a couple at a time, and going back and forth between, a lot has been accomplished. Packing up Pyrex while watching Willow with Kiddo. Taking a few moments to gather up hair ties and put them in an upcycled glass candy jar. Blogging while waiting for glue to dry. And that's a rather long review of my weekend. What were you up to? Those blueberries look amazing!!! We went peach picking on Saturday and it was awesome.